Because a Daisy BB gun is just about everyone’s first gun, it could just possibly be the most important gun in the world. How appropriate it is that we’ve chosen this lever action 650 shot BB gun world-famous BB gun to showcase what is to all of us, the most important amendment in our country’s Bill of Rights: the Second Amendment. 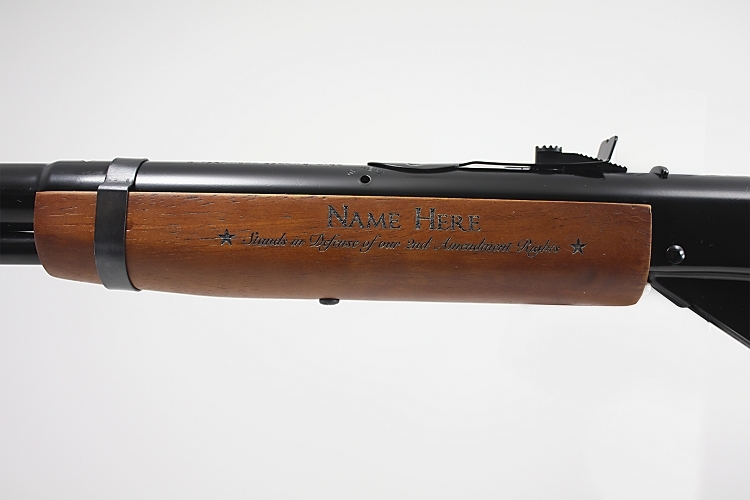 Offered exclusively by The Daisy Airgun Museum, the stock of this Daisy Red Ryder is laser engraved with the text of the Second Amendment to the U.S. Constitution. The three figures engraved alongside the amendment are Uncle Sam, a U.S. soldier and a young boy. Notice that the soldier and Uncle Sam are looking toward the boy, symbolic of how our youth are the future of our country and the future defense against infringement on our rights. The laser engraving on the forearm will include your name – and proudly states that you stand in defense of our citizens’ right to bear arms. Let the world know that you stand in defense of the Second Amendment. Display one proudly in your home or office. Give one to the parent or grandparent who bought you your first BB gun. Hand one down to a young person whose generation will take up the fight to protect our rights. The $60 price of this gun includes personalization with one name on the forearm. Not a limited edition. This gun takes up to FOUR weeks for engraving.